Nepenthes truncata is a large pitchering Nepenthes that is fairly spectacular. The leaves are very large and truncated, or kind of cut off. You can see in the top picture how wide and spread out they are. My lowland N. truncata plant I got in 1992. 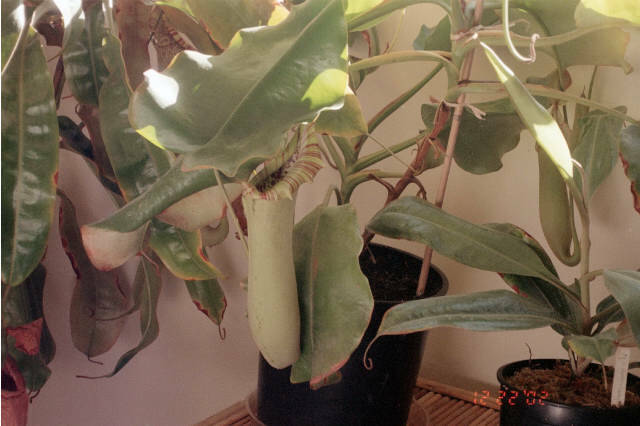 It was one of my first Nepenthes and I grew this guy in a hot box as a terrarium plant at the time. It grew very stout and stocky and put out beautiful pitchers quickly. Unfortunately I had to move and break down my terrarium. I kept this guy and grew him as a houseplant under a sunny window like in the photos. N. truncata was truly one of my first Nepenthes to grow this way because I had no other way to grow the large plant at the time. It pitchers up occasionally but it would do much better in warmer, humid, sunnier conditions. The plant has multiple growth points and several feet across. Someday I hope to get it into optimal conditions so it will pitcher every time. This is also an extremely popular species to hybridize with. Exotica Plants has put out countless hybrids using N. truncata as a parent. The other N. truncata variety I grow outdoors is the highland version from Borneo Exotics. I must admit that I've had a tough time establishing this plant. First offerings from seed several years ago were quite expensive. The most valuable is the black variety that is very limited in some collections that came from the original seed grown specimens. Now Borneo Exotics has many clones in tissue culture and large plants are relatively inexpensive. This N. truncata grows best as an intermediate than a highlander. I couldn't provide enough light indoors so I've been growing them outdoors. The latest photo shows a highland variety that looks very much like my lowland in coloration. When I got the plant, I don't recall this kind of coloration. Definitely it had more red in it. Maybe with more exposure to the sun, the pitchers may redden up more. They seem to adapt to my outdoor conditions but definitely detest my winter low 40's. I'll have to move them indoors to weather them through the winter so they don't stress. Most other growers have no problems growing the highland version and there's some nice photos of their plants in the forums.